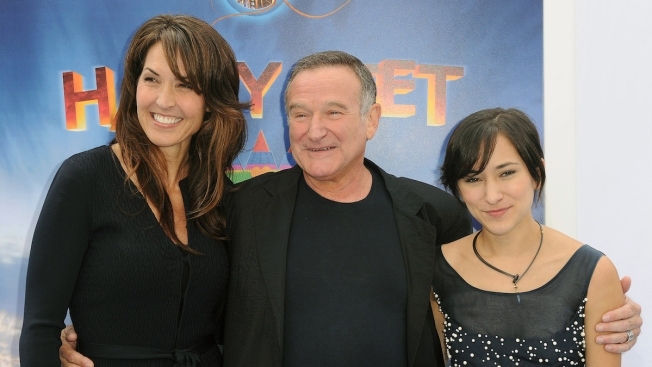 In this Nov. 13, 2011 file photo, Susan Schneider, from left, Robin Williams, and Zelda Williams arrive at the premiere of "Happy Feet Two" at Grauman's Chinese Theater, in Los Angeles. 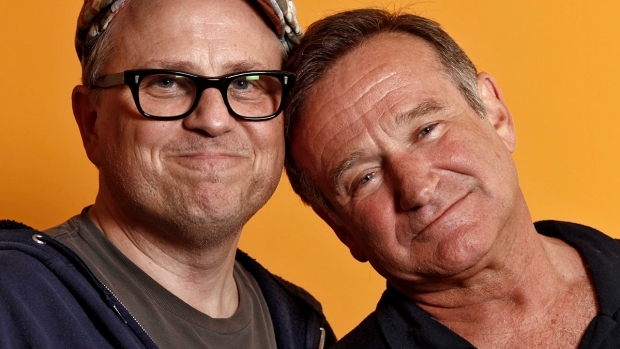 Williams' children and wife are fighting over the late comedian's estate in a California court. In papers filed in December 2014 in San Francisco Superior Court, Williams' wife, Susan, accuses the comedian's children from two previous marriages of taking items without her permission. Robin Williams' children and wife have gone to court in a fight over the late comedian's estate. In papers filed in December in San Francisco Superior Court, Williams' wife, Susan, accuses the comedian's children from two previous marriages of taking items without her permission and asks the court to exclude the contents of the Tiburon home that she shared with Williams from the jewelry, memorabilia and other items Williams wanted the children to have. The children, Zachary, Zelda and Cody, counter that Susan Williams is "adding insult to a terrible injury'' by trying to change the trust agreement and rob them of the late actor's clothing and other personal items. "The Williams' children are heartbroken that Petitioner, Mr. Williams' wife of less than three years, has acted against his wishes by challenging the plans he so carefully made for his estate,'' attorneys for the children said in court papers. Williams died at his Tiburon home in August. The coroner ruled Williams' death a suicide that resulted from asphyxia caused by hanging. Susan Williams has said the actor and comedian was struggling with depression, anxiety and a recent Parkinson's disease diagnosis when his personal assistant found him dead. Williams had publicly acknowledged periodic struggles with substance abuse, and he had entered a substance abuse program shortly before his death. According to the coroner's report, his wife told an investigator that Williams did not go there because of recent drug or alcohol abuse, but rather to reaffirm the principles of his rehabilitation. Williams' trust granted his children his memorabilia and awards in the entertainment industry and some other specific personal items, according to court documents. Susan Williams says that because he wanted her to continue to live at the Tiburon home, it makes sense that he intended only for his children to have the specific personal items he delineated that were kept at another home he owned in Napa. "Any other interpretation would lead to Mrs. Williams' home being stripped while Mrs. Williams still lives there,'' her attorneys wrote. The children dispute that interpretation, saying there were no specific limits on the location of those items. The two sides also disagree over items put in storage, watches Williams owned and his memorabilia.